Pushmo, after it tests positive for performance enhancing features. Pushmo is one of the 3DS' finest games, easily making the system's best list of 2011, but it didn't stretch our brains to the limit. Don't get us wrong. We spent an untold number of hours scratching our heads and furrowing our brows trying to solve the trickier puzzles, but at the end of the day, the solutions were eventually discovered after a little pushing here, a little pulling there. That said, Nintendo's sequel, Crashmo, makes our brains hurt in a good way. With this game, the word "simple" doesn't apply. Not only can you push and pull blocks, but also slide them around. On top of that, blocks have a tendency to fall, forcing you to think about the series of moves you intend to perform. If anything, Crashmo forces you to map out a game plan. In fact, it's possible to mess up a puzzle with a single maneuver, which ultimately results in having to reset the whole thing. This will definitely frustrate a lot of people. It's tough, almost soul crushing, to make what appear to be the best choices most of the way, only to mess up near the end. At least on the positive side, the team at Intelligent Systems isn't mean. The developers always put the reset switch (two of them, actually) within easy reach. Not only that, but a helpful rewind button lets you erase mistakes; prepare to lean on that crutch the entire way through. Hints also prove useful, along with the ability to zoom in and then rotate the screen for a better look; glasses 3D comes in handy for offering a more in-depth view. 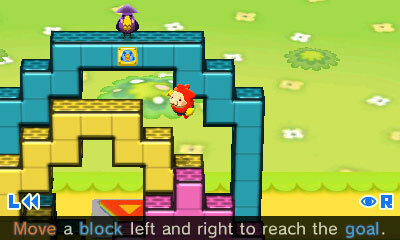 In addition, and similar to Pushmo, you have the ability to create your own Crashmo puzzles through a simple-to-use editor. 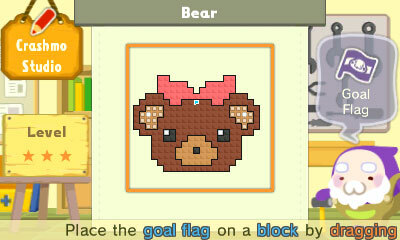 Then, feel free to share them with friends, and download other people's creations via QR codes. Like Pushmo, we expect the community to dream up some stimulating brainteasers. Although it's more difficult than its predecessor, there's plenty to love about Crashmo, from its wealth of puzzles to its cheery graphics and near limitless editing potential. A satisfying follow-up, this game belongs on every 3DS owner's system. What's Hot: Trickier puzzles, sanity saving rewind, puzzle editor, sharing creations with others. What's Not: Crazy learning curve.